Smith Tea Maker is one of my favorite local tea companies. Their teas are so fresh and flavorful. Their peppermint tea is one of my favorite teas. When I get the opportunity I love to go to one of their two tasting rooms. The original Thurman street tasting room is my favorite. It’s a smaller tasting room than their Washington street location, but i love the cozy personal atmosphere within the shop. I stopped by on Friday with a friend and we enjoyed the new seasonal tea selections. 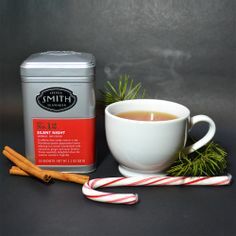 Smith Teamaker has created two seasonal tea flavors for the holidays. The first is called “Morning Light” which is a blend of flavorful high-grown Ceylons, rich and caramelized North Indian Assam and a pinch of Northwest Douglas Fir needles. This blend reminded me of an English breakfast type of black tea. The Douglas Fir needles provide a subtle flavor without overpowering the tea. The Second and my personal favorite is the “Silent Night” tea blend. Northwest-grown peppermint leaves waltzing in a winter wonderland of cinnamon, ginger, and sweet licorice. The flavor is cozy and warming on the cold mornings and evenings. When I visited the tasting room I tried one of their seasonal holiday treats called a hot buttered silent night. It’s a blend of their silent night tea blended with a blend of orange, mace, clove and cinnamon spiced housemate simple syrup combined with milk steamed in clarified butter and dusted with fresh nutmeg and cinnamon. It’s served with a small tea cookie. It was a smooth, rich and creamy treat. I had to slow myself down from drinking so quickly. It’s something definitely worth trying to re-create at home. This beverage was the perfect way to warm up after a chilly and busy shopping day.